A fossil, if you think about it, has not shown its best face in a long time, maybe ever. It has spent millions of years embedded in rock, ice, tar or amber. It is a fossil preparator's job to remove a fossil from the surrounding materials to reveal it for study and display. The difficulty of the preparation depends not only on what the fossilized organism is, but also how it has changed over time. We think of fossils as animals or plants that have mineralized (changed to rock). But, that is only part of the story. Fossils are defined as any traces of life 10,000 years old or older. A fossil can be as subtle as a footprint or as substantial as a skeleton. Whether it mineralizes or not depends on the conditions it experiences and for how long. Living material buried in ocean sediment might get totally replaced with minerals, while living material in a peat bog might survive for thousands of years nearly unchanged. 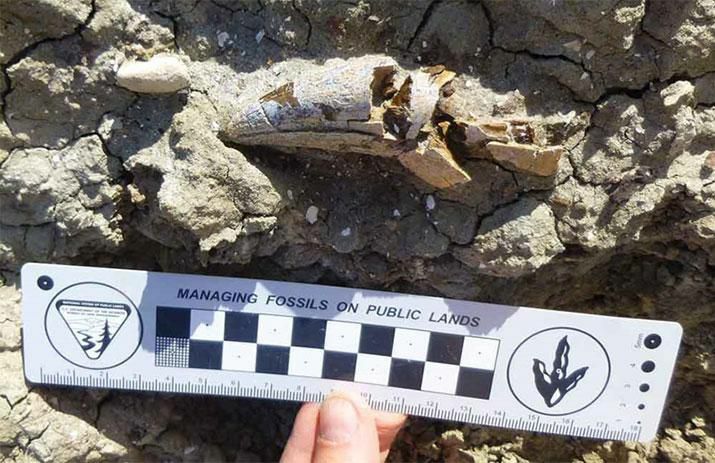 A fossil preparator's work often begins in the field, with the extraction of a fossil from the landscape where it is discovered. Along with the fossil comes a lump of surrounding material, which is left on as protection for packaging and transport to a fossil preparation lab. There, a fossil preparator uses an array of specialized tools to remove the material around the fossil. Depending on the matrix, tools may range from soft brushes to metal dental picks or even air-powered, needle-tipped jackhammers. But not all fossil organisms are created equal. Usually the hard parts of an organism, such as bones, shells, or stems, have fossilized. The soft parts decay or are eaten away. A fossil preparator must piece together fossilized bits of the organism like a puzzle, restoring missing parts using information from other sources about what they should look like. This makes a preparator part scientist, part detective, part artist, and part engineer. 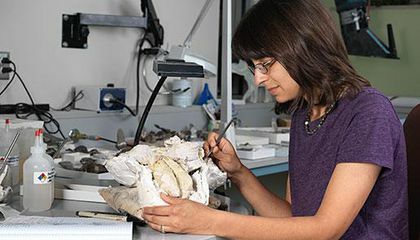 Preparator Michelle Pinsdorf prepares fossils for display and research at the Smithsonian's National Museum of Natural History. Learn more about her job, and how volunteers play a role, in this "Smithsonian Science How" webcast. During Inside the Smithsonian's Fossil Prep Lab, Michelle takes you on a tour of the Fossil Prep Lab while answering questions. You can get teaching resources to use with the webcast. Why does a fossil preparator’s work not end in the field? Because they most start working were the field begins. because most of time they find fossil were they begins. I never knew that this much work went into cleaning and preparing a fossil. As a kid, I would come across them and collect them but thought you couldn't do anything more with it. I think it would be very easy to accidentally break or destroy the fossil when using tools to completely uncover it. They have many thing to do after the field work like analyzing the fossil it self. They sometimes don't have everything they need to use with them at that moment so they have to get the tools they need to finish their work. They start at the beginning of the field. Because there is an endless quantity of fossils to find. A fossil preparator's work does not end in the field, because the fossil has to be taken to the lab. Then, the fossil is prepared by cleaned thoroughly and find any missing pieces if any are missing. Then, the fossil is put to display or studied by scientist. They are always finding more and more fossils and they have to take the fossil from the surrounding material to preserve it even more.